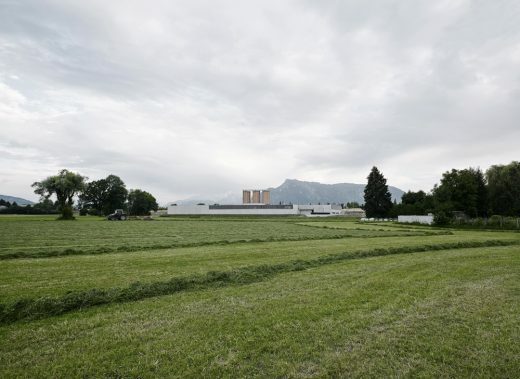 The site of the former energy supply of the city of Salzburg in Salzburg-Lehen makes space for a new urban development based on a concept by Max Rieder. The master plan by transparadiso for the whole quarter focuses on the unique chance of making use of this empty area in Salzburg to offer a contemporary urban living with public space in Salzburg as counterpart to the historical city center and a city being defined by tourism. The goal is to link this new development to the neighborhood defined by after WW II working class housing and creating a strong impact on the whole district. In order to deal with the high density required transparadiso put an even stronger emphasis on developing a public urban zone as boulevard and backbone of the quarter, with Gallery Fotohof (transparadiso) moving in, with a community center and various other cultural uses and NGOs on the ground floor area–altogether transgressing a mere housing quarter. transparadiso (together with Bernd Vlay, Feichtinger Architects, and Land in Sicht / landscape architects) is constructing 300 apartments of social housing (with models for the generation +55 and single parents), and Forsthuber/ Scheithauer are realizing 70 units of students housing. This housing project is accompanied by an EU-program, serving as a pilot project for a whole quarter being conceived as passive energy standard with solar heating. The urban boulevard is crossed by a lowered landscape corridor creating a vertical connection as central element of the new Stadtwerk-Area. This focus point is accentuated by a pedestrian-bike ramp extending its function as barrier-free connection as a multifunctional object for skaters as well as offering “balconies” for seating and communication with the playground located below. In 2007 transparadiso was awarded the Otto-Wagner-Prize for Urban Design for Salzburg stadt:werk:lehen. June 1, 2010 in Austria.